Built in 2008, the surgery center at SCBHS features two state-of-the-art operating rooms, an endoscopy procedure room, pre-op and post-op patient care rooms, as well as clinical consult and small procedure rooms. We have outreach surgeons that specialize in general surgery, wound care, orthopedics, podiatry, urology, and ophthalmology. We have a dedicated team of healthcare professionals that will ensure all your needs are met during your stay at SCBHS. 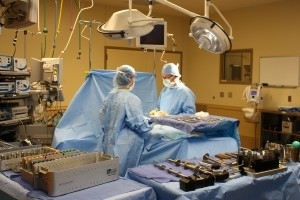 Some examples of surgeries/procedures that can be done at SCBHS include colonoscopies, endoscopies, hernia repairs, gallbladder removal, lumpectomy, mastectomy, carpal tunnel repairs, cataracts, hip and knee replacements, joint scopes, rotator cuff repairs, wound debridement, cystoscopy, bunionectomy, port-a-cath placement, pacemaker placement and more! Ask your doctor to have your surgery/procedure done close to home at SCBHS today!